Sunday seems a good time to talk about an issue I imagine many of us would be fairly familiar with - stress. Whether it be work-related, money-related, relationship-related, or personal stresses (to name just a few), stress seems to creep into so many areas of our lives. With today's fast paced performance-driven society, I know I for one struggle to balance different elements of life and find it hard to keep a healthy work/life balance and maintain a sense of wellbeing. Its only been in recent weeks I've realised quite how stressed I am, and also that I don't manage that stress particularly well. Some of the common effects of stress are irritability, anxiety, weight gain (or loss in some cases), lowering of the immune system, a negative out look and the inability to focus. When I had a health consultation at my gym last week, the nutritionist spoke to me about the physical effects of stress on the body - in particular the storing of fat around the waist. For me this is my biggest 'problem' area, and combined with a fairly high-sugar diet I found it really difficult to shift the extra pounds. I've started to radically cut down on the amount of sugar I eat (even looking at things such as what I thought was a fairly healthy breakfast of Bran Flakes - so high in sugar!) it an attempt to tackle this, as well as learning to deal with stress and manage it more effectively. So over the past few weeks I've been really thinking about some of the consequences of stress - sadly, many of which I suffer from - and now want to take the positive step of focusing more on what I can do about it. First, as I mentioned in my New Year Post I wanted to strike a better work/life balance and spend more time doing things for me. I went through a phase of feeling really dizzy and anxious at work and my Doctor decided it was most likely stress-related. His advice? More exercise - and just going for a 'brisk walk' sadly doesn't count when you're twenty-six and should be in the peak of health (pah!). So a couple of weeks ago I re-joined the gym and am getting right back into it! I love Body Combat classes, started Beginners Cycling (Spinning) last week and have had a training programme drafted for me by one of the fitness instructors. Try to have a positive attitude. I think you can train yourself to be an optimist - make a conscious decision to think positively, and when you notice yourself showing a negative attitude challenge it. Why do you think like that? Alter it. Accept that you are not Wonder Woman and can't be perfect. I think society today has very much spawned an attitude of 'we must be able to do it all with ease and be perfect'. We're not. Accept it, and start to feel more content. If your workload is stressing you out, then find real, manageable ways to reduce it. Yes, I have lots of marking to do but no, no-one will die if its done a few days later than I'd like. Again, accepting you can't always do things as quickly/efficiently/perfectly as you'd like. Life is too short. Avoid people that get you down. I read a really great article in Psychologies magazine (Feb issue) about ways to increase happiness and healthiness - one of those was about subtly managing those you interact with. We all have that one colleague/friend/relative that just puts a downer on everything. Surround yourself with positive, optimistic people and that will rub off. Spread the joy! Meditate. Get a massage. Do yoga. Listen to music. Find something that works for you and helps you to relax - try and do it once a day/week to really help you feel Zen (!!) and tackle those negative stressful vibes. You may feel silly meditating at first, but if it makes you feel better, isn't it worth a shot? I talked last month about the importance of sleep so wont bore you with that again, but make sure you're sleeping enough... but not too much. Get out of bed at a decent time at the weekend, but be well rested. That way you can tackle the world and do all those fun things you don't get to do mid week, and really make the most of life. 'Cos lets not forgot - its short, make it count. This is an excellent post lovely :) it is so easy to get caught up in the crazy world that we live in today! Personally, I find exercise and meditation the two things that really help control my stress and anxiety levels! That and being super organised! 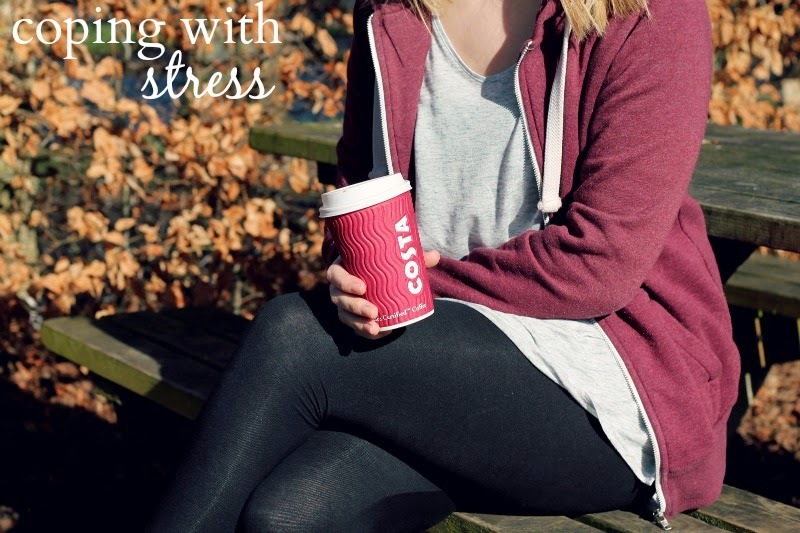 Great post, I am struggling with stress at the moment and unfortunately a symptom for me is acne breakouts which stresses me out even more. But I'm working on it, sometimes it's just nice to know you're not the only one. Stress has been the focus of my life recently but some good |TV and lots of scented candles are helping me unwind! Also your blog is GREAT.